Printing with linoleum blocks allows Fick to produce bold, graphic marks that draw on an aesthetic found in comic books and black and white monster movies. His images are often satirical and political in nature, building upon the tradition of Daumier and Posada. Untitled (Scab) is one of a series of prints addressing America's growing fear of evil, terror, and the unknown in a post-9/11 world. Irritating at best and infectious at worst, scabs are simultaneously a mark of healing and a temptation to re-open past wounds. And although the scab may appear grotesque, its intricacy remains alluring. 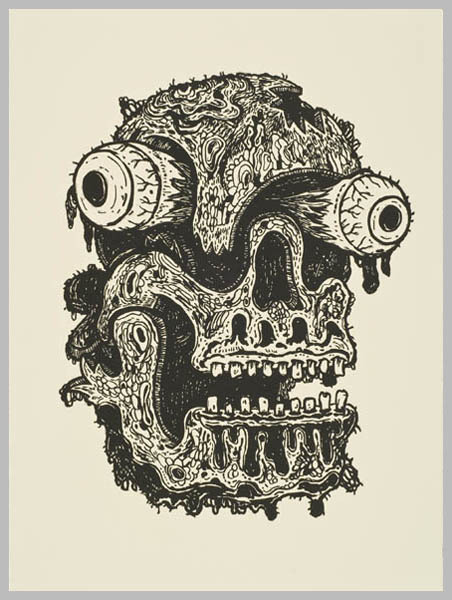 Googley Eyed Zombie is one of a series of prints addressing America's growing fear of evil, terror, and the unknown in a post-9/11 world. The Zombie symbolizes the first presence to arrive on the scene of the 9/11 attacks- death. The skull and zombie head, relatively new to Fick’s visual iconography, are all at once alluring, beautiful, and grotesque. Bill Fick, artist and Director of the North Carolina based Cockeyed Press (cockeyedpress.com), was invited to collaborate on a print at RBPMW through our Guest Master Printmaker Program. Fick often produces mass multiples of his work in order to reach the largest possible audience for the lowest possible price. 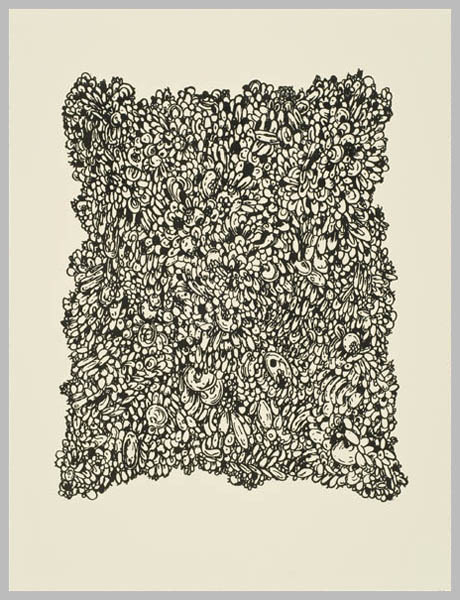 In addition to this limited edition work on paper, this image was also printed on a number of T-shirts as part of a demonstration and lecture on Fick’s work and process at RBPMW. You can find more of Fick's work at www.billfick.com.